"Arf!" exclaims the prairie rabbit on the cover of The Zappa Album -and for a good reason.The rabbit's utterance captures perfectly the fundamental spirit of Ensemble Ambrosius' The Zappa Album: the music and legacy of Frank Zappa (1940-1993). A composer, guitarist and innovator par excellence, Zappa never shied away from avant-garde and always opted for the most daring, the most demanding solutions throughout his career. This trailblazing artistic integrity is greatly in evidence in the Zappa Album, a new release from Ensemble Ambrosius, a group that plays contemporary music with Baroque instruments, such as the harpsichord and the Baroque oboe. The challenge Ensemble Ambrosius chose to face in The Zappa Album was simple and daunting at the same time: to translate Zappa's music into the Baroque instrumental idiom. The combination is improbable, yet it works perfectly in The Zappa Album. Zappa's idiosyncratic and often difficult compositions ranging from his legendary output of the 1960s with the band Mothers of Invention to his more classically oriented Synclavier works of the 1990s are played in the new album with verve and skill. 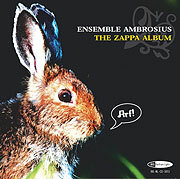 So much so, that when the master's widow Gail Zappa, who controls the rights to Zappa's music, heard Ensemble Ambrosius' rendition of Zappa for the first time, she immediately approved the whole project, making The Zappa Album one of the few recordings of Zappa performed by other artists ever released in co-operation with The Zappa Family Trust. Ms. Zappa, however, had a one request. Zappa himself had always emphasized the significance of conceptual continuity in his art, which time and again returned to same themes and topics. This in mind Ms. Zappa asked if the rabbit on the cover of The Zappa Album could utter one of Zappa's keywords: Arf! Ensemble Ambrosius was more than happy to oblige. Ensemble Ambrosius is based in Helsinki, Finland. Ambrosians are young professional musicians, who share rigorous training in early music and mutual interest in all forms of contemporay music: pop, rock and classical.